Oscilloscope & Signal generator application is used for generating and observing signals on the circuit. Bode analyzer application is used to measure frequency response of Low Pass and High Pass Filters. Fig. 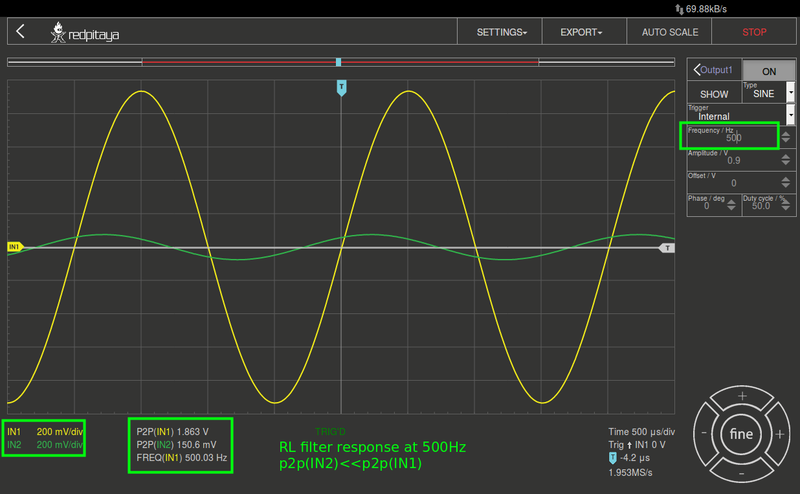 9.1 Figure 1: Low Pass RC filter. Fig. 9.2 Figure 2: High Pass RL filter. If a filter passes high frequencies and rejects low frequencies, then it is a high-pass filter. Conversely, if it passes low frequencies and rejects high ones, it is a low-pass filter. Filters, like most things, aren’t perfect. They don’t absolutely pass some frequencies and absolutely reject others. A frequency is considered passed if its magnitude (voltage amplitude) is within 70% or \(1/sqrt(2)\) of the maximum amplitude passed and rejected otherwise. The 70% frequency is called corner frequency, roll-off frequency or half-power frequency. 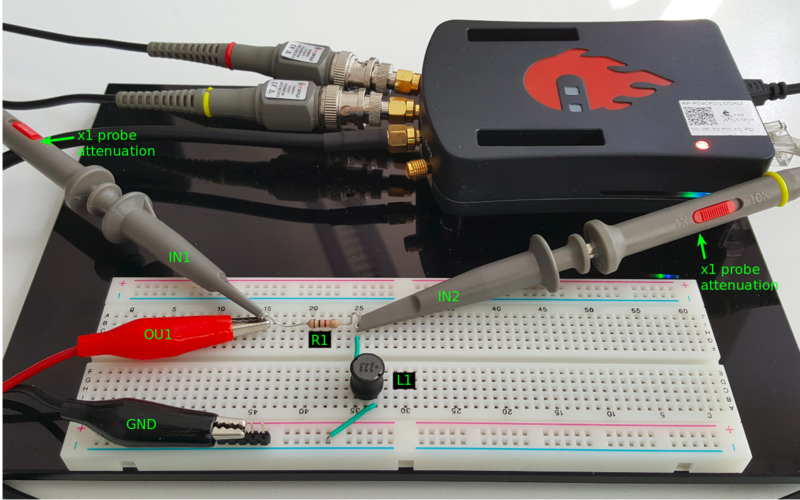 Connect the Oscilloscope & Signal generator probes as is shown in figure 4. Set the oscilloscope attenuation to x1. 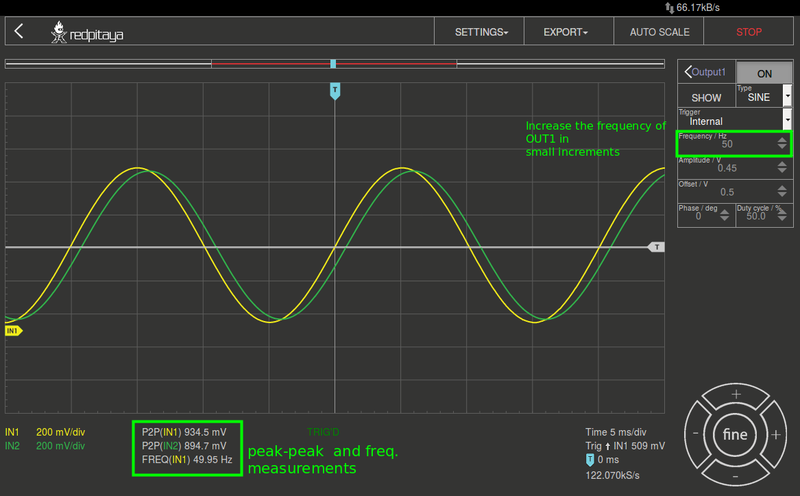 In the OUT1 settings menu set DC offset value to 0.5 and Amplitude value to 0.5V to apply a 1Vp-p sine wave centered on 0.5 V as the input voltage to the circuit. From the waveform menu select SINE signal, deselect SHOW button and select enable. 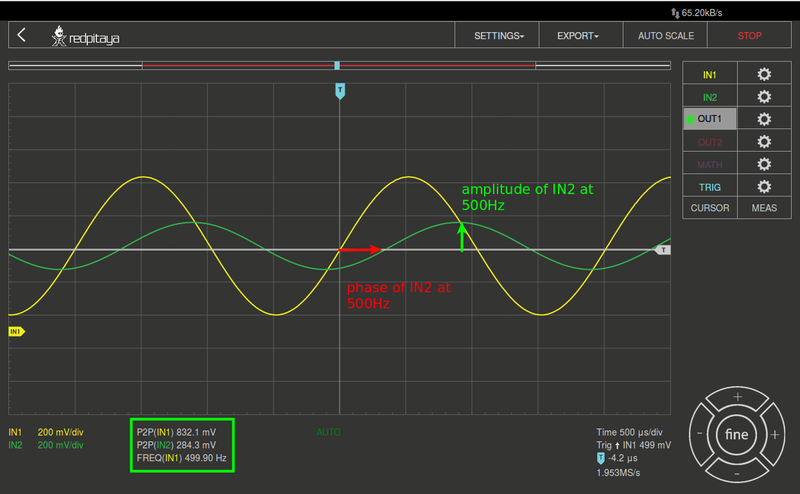 On the left bottom of the screen be sure that IN1 V/div and IN2 V/div are both set to 200mV/div (You can set V/div by selecting the desired channel and using vertical +/- controls) In the IN1 and IN2 settings menu set the value of Vertical Offset to -500mV For the stable acquisition set the trigger level in TRIGGER menu to 0.5V and select NORMAL. 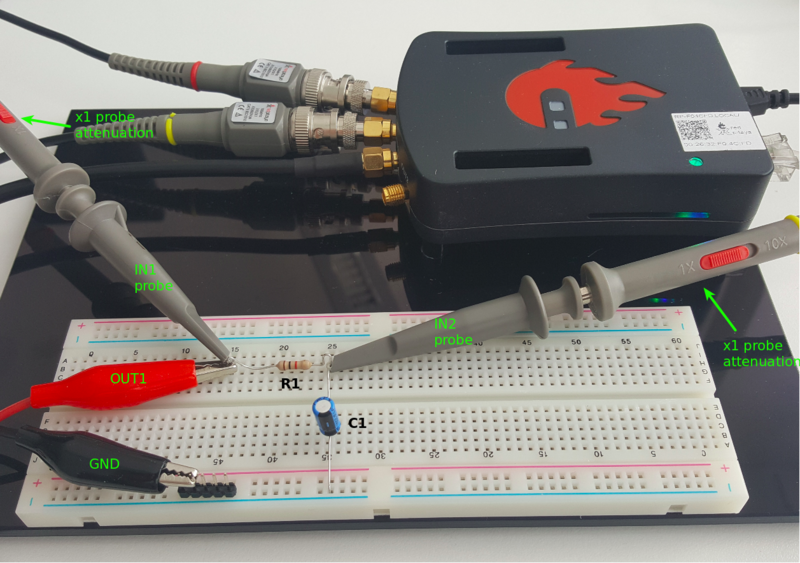 Start with a low frequency, 50 Hz, and measure output voltage IN1 peak to peak from the scope screen. It should be same as channel OUT1 output. Increase the frequency of OUT1 in small increments until the peak-peak voltage of channel IN2 is roughly 0.7 times the peak to peak voltage for channel IN1. Compute the 70 % of Vp-p and obtain the frequency at which this happens on the Oscilloscope. 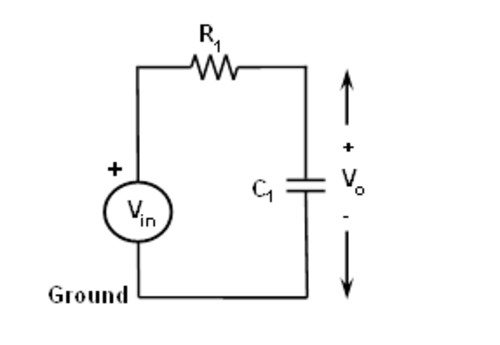 Set up the RL circuit as shown in figure 2 on your solderless breadboard, with the component values R1 = 1 KΩ, L1 = 22 mH. Connect the Oscilloscope & Signal generator probes as is shown in figure 7. Start with a high frequency 50 KHz and measure output voltage IN2 peak to peak from the scope screen. It should be same as channel IN1 peak to peak. 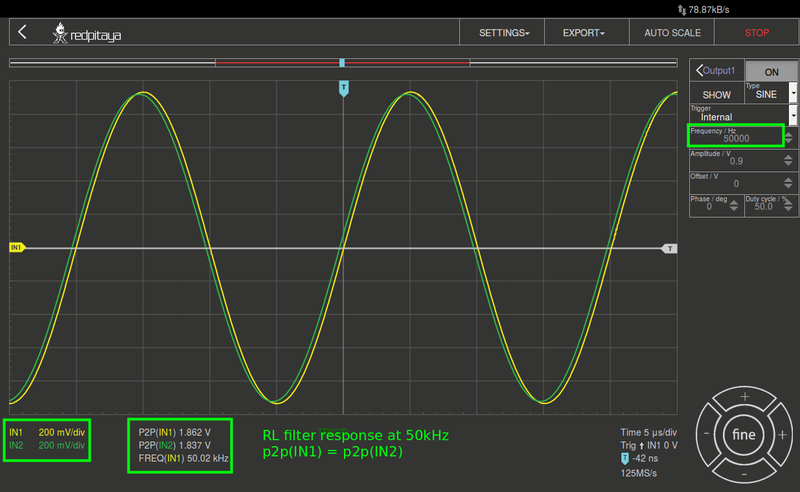 Lower the frequency of channel OUT1 in small increments until the peak-peak voltage of channel IN2 is roughly 0.7 times the peak to peak voltage for channel A. Compute the 70 % of Vp-p and obtain the frequency at which this happens on the Oscilloscope. This gives the cut-off (roll-off) frequency for the constructed High Pass RL filter. The Bode analyzer application will make a frequency sweep in such way it will generate sine signal on OUT1 within frequency range selected by us(in settings menu). IN1 input signal is directly connected to OUT1 following that IN1=Vin. 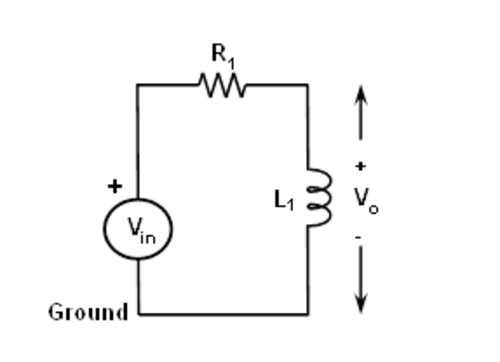 IN2 is connected on the other side of the RL(RC) filter and from that IN2=Vout. Bode analyzer application will then for each frequency step take the ratio of IN1/IN2 and calculate frequency response. Questions Calculate the Cut-off frequencies for the RC low pass and RL high pass filter using equations (1) and (2). Compare the computed theoretical values to the ones obtained from the experimental measurements and provide a suitable explanation for any differences.